There's been a bit of a craft and writing hiatus in these here parts. Whoops. Something tells me its time to reorganise my priorities. Can you help? Let's close our eyes and repeat together: a tidy house is a sign of a wasted life; a tidy house is a sign of a wasted life. Last week (as the ironing accumulated, floor gathered dust and children went hungry) I managed to complete a small project. This is my entry for the "Hottie Cover Challenge Exhibition", which is a charitable initiative being run by retail gallery, Open Drawer. All money raised will be going to the Margaret Pratt Foundation. 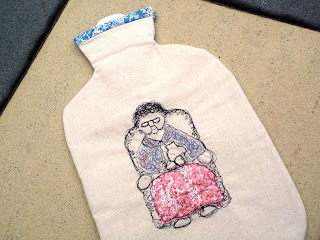 My hot water bottle cover has been submitted as part of a large group entry, organised by the lovely Cam from Curlypops. I jokingly told Cam I was going to do something a bit nanna. Sadly the only nanna-ish thing I could think to make was er, an actual nanna. Anyway, here is Nanna sitting in a chair with a knee rug and her own hottie. The front of the cover is osnaburg and the back is made up mystery blue and pink florals that caught my eye in Spotlight. Nanna is a combination of dimensional applique, beading and free-motion machine stitching. If you would like to see some absolutely beautiful examples of hottie covers - with not a square nose in sight - do try and pop into Open Drawer between now and 24 July. If you are out-of-town you can take a virtual tour of a selection of covers right here. Love it - you're so clever! 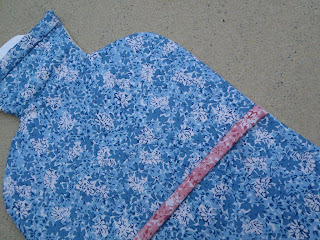 I love the textured effect of 'drawing' with a sewing machine. I was looking at this tonight at the opening and it made me smile - a lot. I love her!! Love her beads, too. I am unreasonably excited to 'see' you! And Nanna is superb. I'm 97, I look just like that. I cannot do freemotion! After Nikki's efforts on the patchwork the other day and now this? I so need to have a go and I am going to be sooooo disappointed it's not this good. "it's not slave labour, small children like cleaning house, it's develops their character" - and repeat! There's been a bit of a craft and writing hiatus in these here parts. Yes. You have been missed. I love your hottie! Very clever. 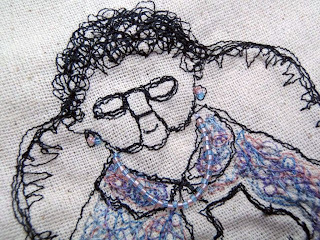 Nana had lots and lots of admirers... expecially that amazing free hand embroidery. You are superbly talented! Just gorgeous! I wish I was closer to go and see the exhibit. I wanted to tell you that your little nanna hottie has a new home! I absolutely love it and though I had EVERY intention of gifting it to my mum, I just can't bear to part with it now she is up on the wall! Well done - it's really cool! Cool website, looks very clean and organized. It is nice trying to It was the first time I had tried "drawing" with a machine.